Figure 1. This grandidierite sample, weighing 8.26 ct and measuring approximately 14 × 11 × 7 mm, was acquired in Madagascar by one of the authors. Photo by Victoria Raynaud. Grandidierite was first described in southern Madagascar in 1902. The mineral is very rare; gem-quality material of facetable size was almost unheard of in the market before the summer of 2015. In September 2015, GIA’s Bangkok lab issued identification reports for several faceted grandidierite samples, which reached the consumer market the following month. The submitted stones ranged from 0.9 to 2.3 ct. Around the same time, one of the authors (VP) returned from a field expedition to Madagascar, where he had received some unidentified stones from Jack Mampihao. Included with the material was one unfamiliar rough fragment, weighing 8.26 ct and measuring approximately 14 × 11 × 7 mm (figure 1), which Mr. Mampihao said came from a mine near Tolianaro, in the Tranomaro area at the southern tip of the country. Mr. Mampihao reported that a large number of these stones were found, but they were unknown to local miners and dealers. Currently, we have no information about the exact amount and quality of this material. 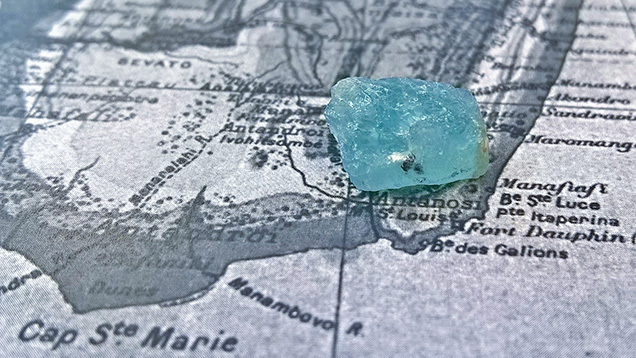 Gem-quality grandidierite has been attributed to deposits in southern Madagascar, near Tolianaro (formerly Fort-Dauphin), and in Sri Lanka. With a chemical formula of (Mg, Fe2+)Al3(BO3)(SiO4)O2, the mineral belongs to the orthorhombic crystal system. 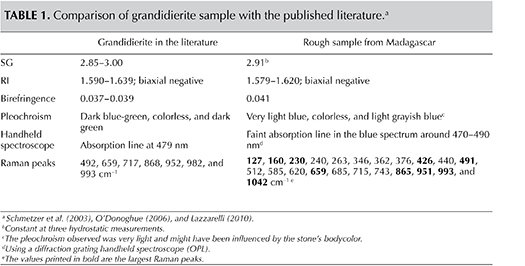 All anisotropic minerals display pleochroism to varying degrees; grandidierite shows dark blue-green, dark green, and colorless (M. O’Donoghue, Gems: Their Sources, Descriptions and Identification, 6th ed., Butterworth-Heinemann, London, 2006). Its bodycolor ranges from bluish green to greenish blue (A. Thomas, Gemstones: Properties, Identification and Use, New Holland Publishers Ltd., London, 2009). Grandidierite has an RI of 1.590–1.639 (O’Donoghue, 2006) and a birefringence of 0.037–0.039. Its SG is close to 2.98 (O’Donoghue, 2006; Thomas, 2009), but this value may vary between 2.85 and 3.00, according to other sources (H. N. Lazzarelli, Gemstones Identification Blue Chart, 2010, www.gembluechart.com). A previous study has shown an absorption line at 479 nm (K. Schmetzer et al., “The first transparent faceted grandidierite, from Sri Lanka,” Spring 2003 G&G, pp. 32–37). 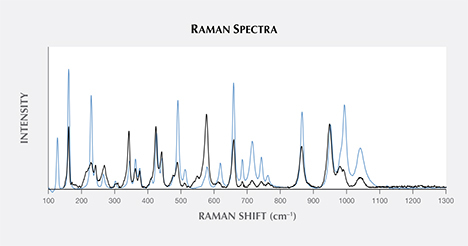 In that study, Raman spectroscopy was carried out on a single gem-quality grandidierite, and the same sample was subjected to composition analysis. The gemological properties of our rough sample were compared with the literature; the results are given in table 1. The stone was analyzed using LA-ICP-MS (table 2). Three spots were analyzed and compared to data obtained by Schmetzer et al. (2003). The sample had a very low iron content compared to the earlier study. This may be explained by the elevated Mg content, since the two elements often substitute for each other. An exact comparison of the datasets should be done with care, since different techniques were used to analyze the composition. Schmetzer (2003) used electron microprobe analysis (EPMA), while the present authors used LA-ICP-MS. Using a diffraction grating handheld spectroscope, we observed a very faint line in the blue region of the visible spectrum (approximately 470–490 nm). 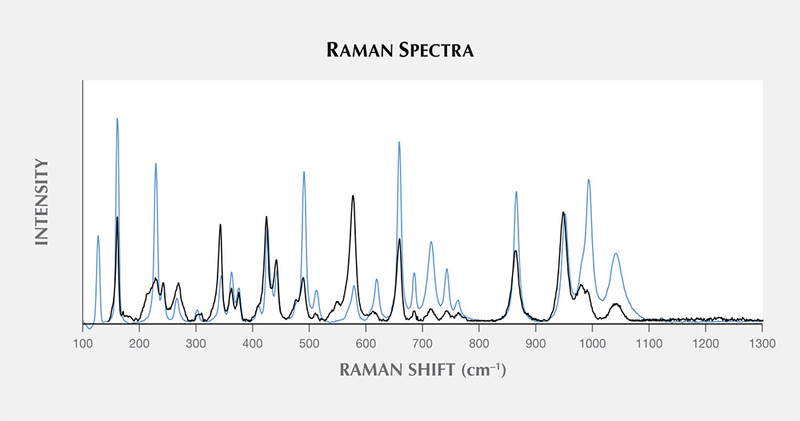 The Raman spectrum matched closely with the RRUFF spectrum for grandidierite (figure 2). Both spectra were taken on unoriented samples. TABLE 2. Analysis of a previously studied grandidierite and a recent sample from Madagascar (wt.%). aElectron microprobe analysis (EPMA), with total iron as FeO. TiO2, V2O3, and CaO were detected (each 0.01%) but are not included here. bLaser ablation–inductively coupled plasma–mass spectrometry (LA-ICP-MS). cThe standard deviations are listed between parentheses. Figure 2. 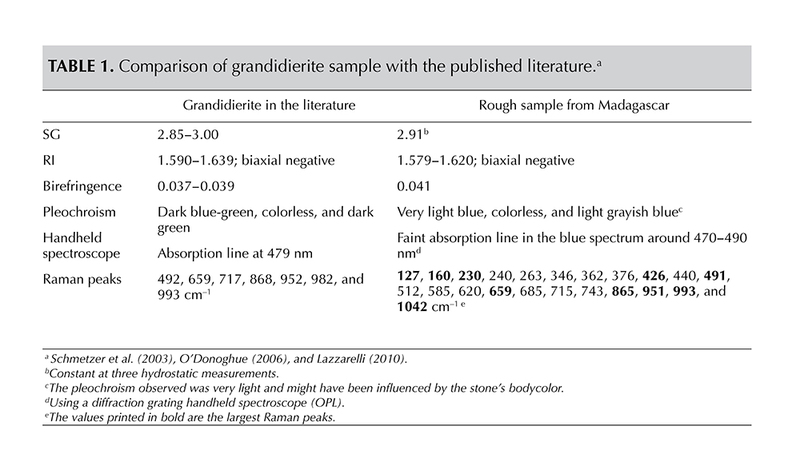 This comparison of the Raman spectra of the grandidierite from Madagascar (blue spectrum) and a sample in the RRUFF database (black spectrum) provides further confirmation that the previously unidentified material is grandidierite. All the characteristics of the unknown stone obtained in Madagascar matched with grandidierite. Some values fell outside the previously reported ranges, but they were within acceptable ranges for a mineral that has not been studied in depth and for a sample that is from an unknown deposit. With field collection and lab testing pointing to new sources of grandidierite, this could be a step toward a larger market presence for this material. Wim Vertriest and Stanislas Detroyat are trainees in the field gemology department, Supharart Sangsawong is a scientist, Victoria Raynaud is a trainee analyst, and Vincent Pardieu is a senior manager in the field gemology department, at GIA in Bangkok. Gemological, chemical, and spectroscopic properties are presented for the first known transparent faceted grandidierite.